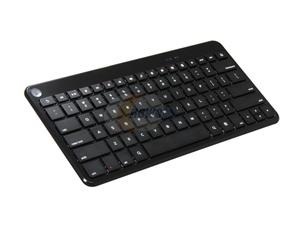 We've featured this particular Motorola keyboard in our deals section before, but the price has never dropped quite so low: the 89451N model Bluetooth keyboard is now a paltry twenty bones on NewEgg's store, with the application of promo code EMCXWVS225. It's also got free shipping. If you want to take advantage of this deal, get a move on - it's only valid until January 30th (next Wednesday). Sorry, international readers, this one's US-only. There are a lot of options in this space, and Motorola's keyboard is generally well-regarded thanks to a slim build and good battery life. It'll work with any Android smartphone or tablet, and though the layout and navigation keys are definitely meant for the everyone's favorite green robot, it'll function on iOS or Windows too. For those of you who don't remember, this particular keyboard was introduced around the same time as the Motorola XOOM, with a laugh-inducing $100 MSRP. If you're more of an Amazon type, the same model is Prime-eligible for $26, no coupon required.